As of the writing of this article, we are starting to see a little relief of anything related to AR15 rifles. Everything from ammo to charging handles are starting to trickle in from backorders long ago however it always seem the part you need is out of stock to complete your AR lower. 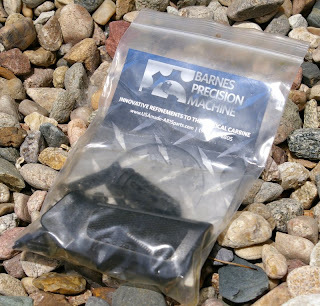 In this case my naked stripped Anderson Manufacturing Lower receiver had sat far too long in the Liberty Safe waiting for me to find all the right parts to get it into action. Instead of chasing parts. I decided to place an order for a lower parts kit with Barnes Precision and patiently wait. 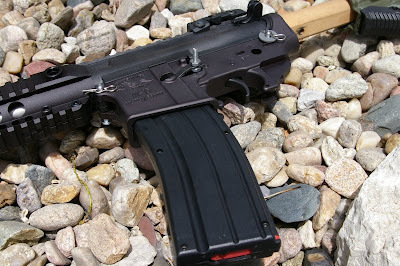 But then I had an idea; could I salvage enough equivalent parts from a hardware store to get a minimally featured AR lower up and running? What parts would I absolutely need, and what could be omitted? Because the AR platform has parts which require more parts which require other parts, the idea was to pair down the AR function list for the lower to what was really required to feed and cycle rounds. This means the bolt latch could be omitted which means four less parts (latch, bolt latch detent, spring, and pin) that I need to scrounge for during a time of desolate parts availability. Same goes for the safety selector. 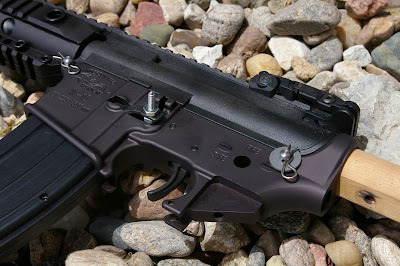 By going to an old “the trigger is the safety” design, I drop three more parts plus the need to have a grip and grip screw to hold in the detent required for the safety selector switch. With that, I even nixed the grip... because I did not have one, however the right machine screw and a dowel rod would have worked for a makeshift grip. The recoil of even the .223 round is so minimal that you can take the full recoil at the shoulder via the buttstock and the back of the receiver gives your enough grip to pull the trigger effectively. Obviously the trigger group is required and I had a complete JP Rifles trigger unit to drop in. You do need two .245” takedown pins which I have found damn near freaking impossible to find. 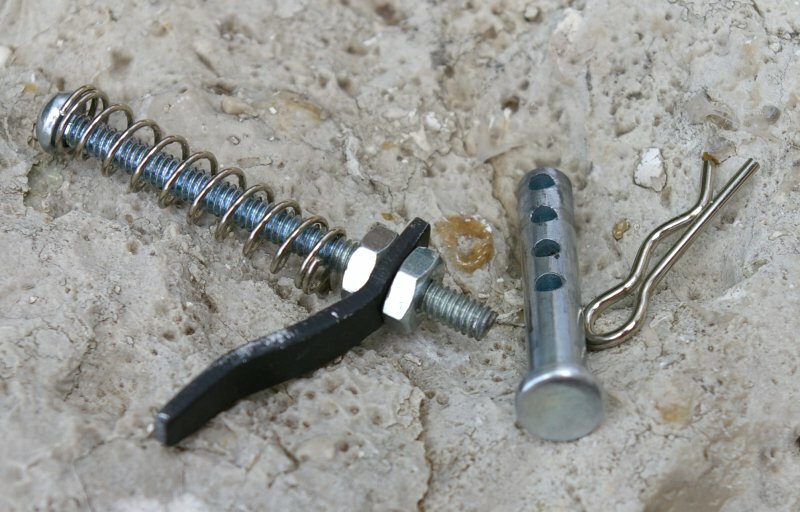 In this case two modified ¼”x2” Clevis pins and spring pins from the hardware store worked for a sum total of $3. Basically the perfect diameter with the exception of the deformation caused by the holes in the pin. A little minor file-work and a spin in the drill with some very fine sandpaper makes them drop in replacements for the front and rear take down pins. I also chopped mine and cut them down to the right length with my Proxxon Mini-Lathe but that is optional extra credit type work and not required. Although duct taping a magazine in place would have certainly worked, I took just a bit more elegant approach which required only a tad of fabrication. I used a 3/16”x1.5” bolt with two nuts to hold a latch I made from ⅛” aluminum scrape I had in the shop. You could screw it down as a permanent fixed magazine or loosen it up and add a 1.25”Lx1/4”w wide spring to provide full function capabilities which functions just like to real deal. I was actually pretty proud of this little part when I was done as it worked perfectly on both the .22LR Black Dog and .223 Troy mags tested. Although all the above omissions will still support .223 round cycling, I decided to go one step further with a .22LR ATI upper which does not even require a buffer tube, buffer, spring, castle nut, and stock. Instead I found a wood Charbroil grill handle (dowel rod) in my shop that I was able to thread into the receiver and attached a broken Mako buttstock with two wood screws. A testament to the AR design, 300-rounds downrange of .22LR and I did not have one issue aside from a few issues with the ATI upper I have come to expect. Even after a swapping out the dowel rod stock for a real buffer tube assembly, I had no issues at all, with the exception that the bolt does not hold back after the last shot, a little hot gas pops out of the bolt latch void, and you need to be darn sure that “safe” means properly clearing the weapon. 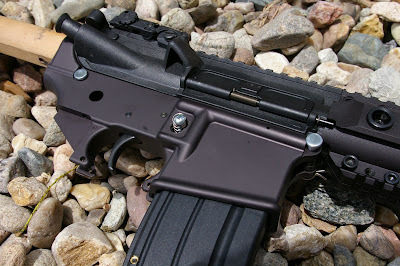 Amazingly, only a couple of bucks of hardware parts can put an AR into commission as a reliable and operable AR... but it will not win any beauty awards. In the end you only have to have a complete buffer tube and trigger assembly to make an AR work with only parts from the hardware store. This was a fun experiment that demonstrated how versatile durable and field serviceable the AR15 can be. 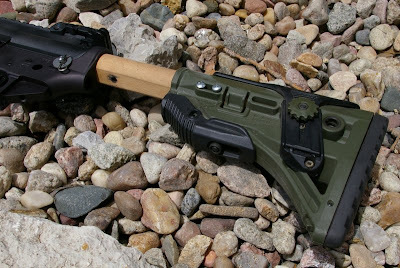 With the exception of the cost of the JP Trigger, and buffer assembly, and broken Mako buttstock, the lower parts cost from the hardware store was less than $5 to deliver a .223 capable AR. If you can find a dedicated .22LR upper or a drop in .22LR conversion kit, a complete buffer tube assembly is not even needed. The kicker to this entire story was that I found my AR lower parts kit shipment on my front doorstep the day after I tested this hacked together AR... I guess I didn’t have to wait that long after all. This experiment was for my personally use and education. Obviously this is for informational purposes only and is not recommended by... well anyone. 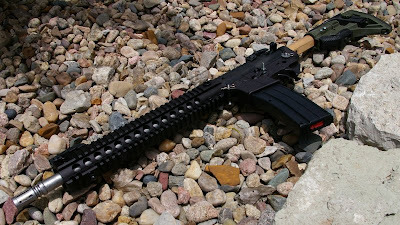 An AR15 is designed to operate with the proper parts with the safety and other MIl-Spec parts attached. Use of this information is strictly at your own risk. This sounds like a great tutorial on how to keep an AR15 banging away in a post-SHTF scenario when there's zero access to all of those pricey, tiny & specialized parts.